My mother is from Mogok, a chilly gem-mining town in the hilly north of Burma, where everyone adores pork (I mentioned before that they refer to wages as "pork funds"). This classic Mogok curry is more or less used to wean Burmese children - my nephews and nieces can eat bowls and bowls of the stuff, as it's sweet and mild, yet addictive. Before my youngest nephew could talk properly, whenever he visited his grandparents, he'd ask for "pork and yice" (pork and rice), and I'm pleased to say that my one year old daughter is now an equally big fan. Toss the pork thoroughly in the vinegar and then discard the vinegar. 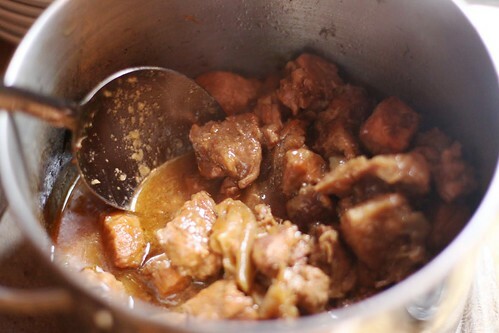 Place the pork in a large saucepan and add enough water to just submerge the pork. Cover the saucepan with a lid and bring to the boil. Turn the heat down to medium low and continue to simmer the pork for 15 minutes, still with the lid on. Remove the pork and set to one side; pour the pork juices into a bowl and reserve. Do not wash the saucepan - you'll reuse it later. Slice the onions into wedges, and bruise the garlic. Pound the ginger into a rough pulp in a pestle and mortar, and add 2 tablespoons of water in the well of the mortar to make ginger juice. Heat the oil in the saucepan on medium-high. Add the pork cubes and toss for 4-5 minutes until browned all over, followed by the onion wedges, bruised garlic and ginger juice (but not the ginger pulp) and stir-fry for another minute. Add the reserved pork juices, sugar, light and dark soy sauces, chilli powder and pepper, and 500ml water. Cover the saucepan with a lid and bring to the boil. Now turn down the heat to medium-low and simmer for 1 ½ hours OR transfer everything to a lidded casserole dish and bake at 160 degrees for 1 ½ hours. When the time is up, the pork should be tender and fall apart if you poke it with a fork. Served with lots of fluffy white rice and stir-fried greens on the side. I love being told not to wash the saucepan! Yup, another one of the reasons I love it! This sounds so delicious - I'm not surprised your baby is a fan! Also sounds very simple - great for a mid-week supper. Thanks! And yes, you can start if off and more or less forget about it, or you can make a batch, freeze portions and then heat during the week. Ooh, let me know what they think and thank you! Made this today for my nieces - they're already big fans of pork - and it seems are new big fans of Burmese pork curry. It was really easy to make, so thank you for posting the recipe. Had a question about how wet it was meant to be as we had a lot of liquid - is it meant to have a lot of sauce - and unthickened? It was delicious sauce, but did just want to check. So I tried this out with my kids and they loved it. One thing I did include though was a Star Anise. As you say there is a lot of sauce so I served it up with noodles more like a noodle soup. Could you describe the type of chili powder you're using? Is it the Tex-Mex oriented style I can find at any grocery store in the United States or should I be looking somewhere more Asian oriented like HMart? There's a Burmese curry place near where I live and I am so in love with their sweet pork curry so I can't wait to try this!! Sorry if this seems like a stupid question but what exactly do you mean by tossing the pork in vinegar? Is it just mixing the raw pork around in the vinegar? Hi, it's not a stupid question :) Yes, I mean toss it as if tossing a salad to make sure the raw pork is thoroughly coated in vinegar.